This is a short snippet, not an analysis but a warning to watch your friendly data collector near to you and your friendly government’s use of phobias. A paper published in the Proceedings of the 6th International Conference on Social Computing, Behavioral-Cultural Modeling and Prediction shows that collected communication and social network trails, may turn out to be of highly personal character if not even of psychoanalytical use. Meta-Data prediction models are not perfect yet, but they have a huge potential. 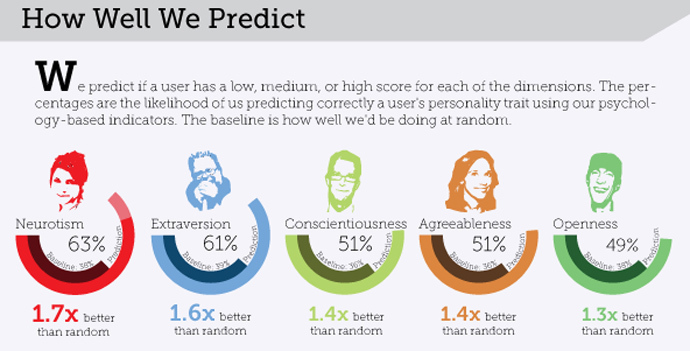 People with superior data mining tools can predict much more than just the personality. The science is not there yet, but a potential is to know the subject better than the subject understand him/her-self. Of course, also to predict what the subject will do in some patterned situations and to know the right reward and the right punishment for behavior for and against observer’s wishes. It is a dream resource for soft (and hard) totalitarian. A group of US and French researchers found that personality of the speaker on the phone could be reliably predicted by the way he or she makes calls. Their database was collected in the MIT Human Dynamics Lab in a year-and-a-half-long study from March 2010 to June 2011. Diversity, defined as the ratio between the subject’s total number of contacts and the relative frequency at which he or she interacts with them. To figure out the results of the metadata analysis and to compare it with the personality, ‘hidden’ behind it, the organizational psychologists had determined psycho-types of 100 students, who participated in the survey (with a final sample of 69 people), and divided them also into five categories. They used major dimensions in the Big Five model (also called Five Factor Model) of personality, which also consists of conscientiousness, extraversion, neuroticism, openness to experience, and agreeableness. Over the past few decades, personality psychology (mostly for marketing purpose) reached the consensus that the adjectives people use everywhere could be subsumed into five general constructs. As far back as William McDougall (1932) noted that all personality could be measured by five traits: intellect, character, temperament, disposition, and temper. Dixon (1977) argued that terms used to describe thinking, feeling, and acting were found in all recorded human languages. Rieman (1987) attributed this universality to genetics (! )— the genes shared across races and cultures. Subsequently, Costa and McCrae’s five-factor model, measured by the NEO Personality Inventory (NEO-PI), has been tested and its structure replicated in every language and country within which it has been studied. The five-factor model was actually one of two separate five-factor theoretical models. One model, popularized by Norman, and Digman purported that to understand and describe personality, one must have and use the terms contained within his/her language. Because personality was necessary for interpersonal interaction, personality traits would have to be in every language for people to coexist. The second model differs in the terms used for the five factors, but both had five similar measures for personality dimensions contrasting both sharply what are good and bad traits. The NEO-PI was associated with Costa and McCrae (1985). The first of its five factors was named Neuroticism or emotional stability. It included aspects of insecurity, tempermentalness, worrying, and self-consciousness, but it also included anxiety, anger, and depression, a factor measuring mental health in terms of normality/abnormality, not just some aspect of normal functioning or coping. Extroversion or Surgency formed the second factor. It was characterized by being friendly,sociable, and outgoing. It also had a hint of value judgement in it as well, but seemed generally more accepted than the neuroticism factor. Openness included being daring, original, open-minded, and imaginative. It involved being accepting of fantasies, feelings, and values. Agreeableness was the fourth factor. It was often contrasted with antagonism, which was characterized by narcissism, perfectionism, and arrogance. Agreeableness included aspects of trust versus skepticism and sympathy versus stubborn uncooperativeness. Factor five, termed Conscientiousness, had also been contrasted with undirectedness. Amelang and Borkenau titled this factor self-control versus impulsivity (!). Some called it superego strength as in an individual’s abilities in persevering, striving for excellence, hard working, and exerting effort with a purposeful direction. The Big Five (v.s. the MBTI) is one of marketing, its not help you to understand yourself, but others to benchmark you against a desired standard behavioral set. These factors are very broad and inclusive, but almost stipulate a Freudian ethic. They assumed that all human could be categorized under these five headings – and measure in a way just adaption to the society. To me, the Big Five, is a tool how good you function in the “rat race” or as consumer. To correct this, there’s growing support for a HEXACO model of personality that adds a sixth trait: honesty-humility. Based on C. G. Jung’s typology [Jung, 1921], people can be classified using four mental functions sensing, intuition, thinking and feeling together with the attitude (extraversion-introversion). An extrovert deals more with the objective whereas an introvert relies more with the subjective – C.G. Jung is quite clear that both the objective and the subjective represent facts and reality. The direction points to the source of energy that feeds the dominant mental function. An extrovert’s source of energy is mainly found in the outside world, whereas an Introvert’s source of energy is mainly found in his or her inner world. C. G. Jung’s classification scheme has been used quite successfully from individuals (I’ve written here) as well in the workplace (see here). The unconscious layer, Carl Jung’s analytical psychology model provides, maps to the structures of the organizational or political conscious and unconscious which parallel what Jung conceived as the architecture of the individual psyche. Attitude Extravert: Outer-directed, need for sociability, chooses people as a source of energy, often action-oriented. Attitude Introvert: Inner-directed, need for privacy and space; chooses solitude to recover energy, often reflective. Thinking function: Logical, analyses (thus rational) cause & effect relations, cool, distant,frank, questioning. Sensing function: Sensory, oriented toward the body and senses, detailed, concrete, present. Intuitive function: Sees many possibilities in situations, goes with hunches not details, sometimes not present. The function that is opposite to sensation. Intuition is a perception of realities that are not known to consciousness, and that come via the unconscious. One rarely finds pure types and originally with Jung obviously there were 8 combinations with ones primary function but ones secondary function may be developed (and rarely the third and forth). The extroverted thinking person tends to be tied to facts, may believe his ideas represent absolute truth and that “the ends justify the means”dislikes and fears the irrational. Introverted thinking person is interested not in facts but ideas. Extroverted feeling person often seems to be well adjusted, charming, concerned with personal relationships. Introverted feeling type are not easily adaptable and may express self in music, poetry, religion. Extroverted sensing type– the object arousing the sensation is the important thing. Introverted sensing types have trouble expressing themselves. Extroverted Intuitive lives see possibilities as important. Last, the Introverted intuitive is concerned with the collective unconscious and has visions or revelations of religious or cosmic nature. 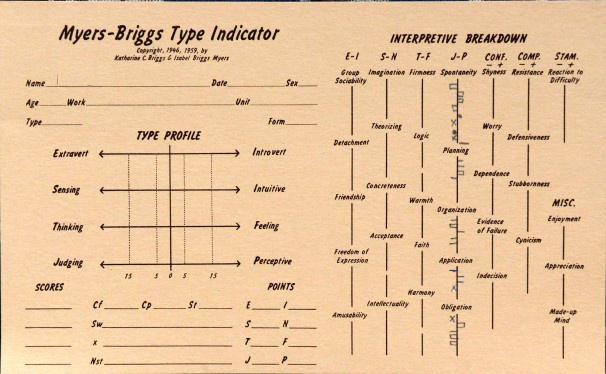 The Myers-Briggs Type Indicator (MBTI) dimensions (Extraversion-Introversion; Sensation-Intuition; Thinking-Feeling; and Judging-Perceiving), based on C.G. Jung formed a tight 4-factor model similar to that of Costa and McCrae’s Big Five model for openness, conscientiousness, agreeableness, extraversion. My thoughts on the Big Five. I find it hard to not look at Openness and neuroticism as a dichotomy. How can we be both open and neurotic at the same time? All in all, the big 5 uses 5 traits, and doesn’t link them together, where as the MBTI uses 8, and links them together. 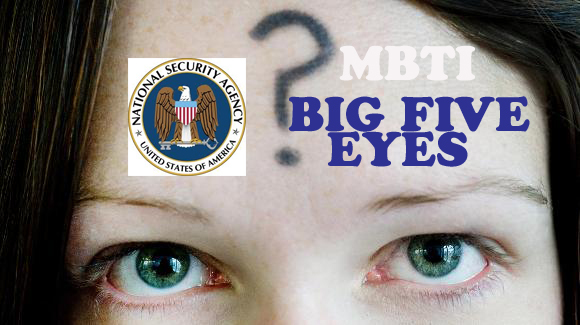 The MBTI just gives more information, however, Big 5 is also more static, and can definitely be used at the same time as MBTI. Jungian’s, however, don’t recognize that just four letters do justice to anyone’s identity for the whole life. Bad leaders, consultants, counselors, coaches, and teachers, had been delivering this message, omitting C.G. Jung’s view of individuation – i.e. that healthy persons are in control of their four functions and grow to manipulate MBTI to money making personality tests. To make matter worse, the Big five seem to judge only one alternative dimension as desirable (unlike C.G. Jung did). I don’t subscribe to this. Extraversion – people who tend to seek stimulation in the company of others, who are outgoing and energetic; I fail to see why the Big Five Model changes the “o” into an “a”…. E of course equals the MBTI E with the implicit assumption that introverts are bad . Agreeableness – sensing, compassionate and cooperative people (easy to manipulate however); Agreeableness, I’d say it may also be Fe , not only F.
Openness – and creative ones, who are open to feelings (intellectually less curious, however); You might recall that thinking and feeling are rational functions to C.G. Jung and to him indeed feeling means either accept or reject. So Openness equals to F, without a mix of N or P, but not with 100% correlations. Conscientiousness – self-disciplined and judging people, who are eager for success ( not perceiving others); Conscientiousness seems like a sure J.
I think the neurotic scale shows us the probability that we are utilizing shadow survival functions. Neuroticism in big 5 is the only scale that doesn’t correlate with MBTI directly. The fifth dimension – neuroticism – will tell which button to press of anxiety, moodiness, worry, envy, and jealousy. Neuroticism is a risk factor for the “internalizing” mental disorders such as phobia, depression and other anxiety disorders, all of which are traditionally called neuroses but become more and more political terms. Furthermore MBTI has N and F in I and E attitude, while Big Five just mixes the both in one, and the rating scales aren’t 100% the same, like 40% openness might still come out as N in MBTI test. Add personalty tests with capabilities to obtain and crunch your data with a big data warehouse for your Twitter, email and Facebook, not to mention your browsing history or Amazon preferences , than psychoanalysis become truly affordable for everybody. Interested will check on your conscientiousness and your eagerness for success like for credit rating or how you do on neuroticism in respect to xyz-phobia. Tags: Big Five Model, C. G. Jung, Evil, jungian psychology, MBTI, NSA, Psychology, Shadow. Bookmark the permalink.